Back in the day, and I mean way back in the day, the idea of fast food was a novel concept. When Ray Kroc founded McDonald’s back in the 1940’s, America was a country undergoing radical lifestyle changes. The lean years of WWII and the post war boom, the Eisenhower Interstate program, and the development of the American suburbs all contributed to the mass production and mass consumption of food by a country on the move. Props to Mickey D’s for telling the people what they want and then giving it to them. But tell me fast food, when exactly did you lose your soul? I say it lost its soul because what you get at any fast food establishment is only food in the strictest sense that it provides calories to fuel your body. I believe that food should also nourish your soul and I think fast food does anything but. Take a hamburger for example; it doesn’t matter if it’s from the Golden Arches or The King. Take a good look at it. Does it look like ground beef? Is it tender and juicy? If you close your eyes, can you taste beef? Or has all the essence been stripped away so that it has to be ‘special sauce, lettuce, cheese, pickle, onions, on a sesame seed bun’ pimped out in order to taste like anything? I’m not here to bust on fast food and I’m not saying fast food is evil. From time to time, I pull up to the drive though just like millions of other people. I’m just saying let’s call it what it is…a highly processed, time management solution. But if I believe that not all fast food is good food, then that has to mean that some fast food is good food and it is fast. I submit Kooper’s Burger Wagon for your consideration. 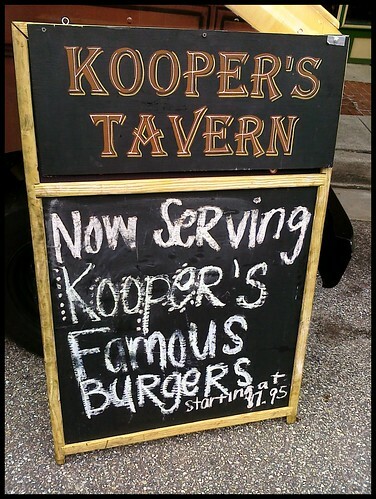 Kooper’s Tavern is a well established restaurant in Fell’s Point. I recall taking the water taxi to Fell’s Point on Friday afternoons when I worked just across the Harbor in Locust Point. Many a long lunch was spent at Kooper’s. And then I changed jobs and Kooper’s and I didn’t see much of each other. But now, I don’t have to go to Kooper’s anymore because Kooper’s can come to me, well almost. What they’ve done is create a mobile hamburger stand that can be found somewhere in the Baltimore area on any given day. They harness the power of Facebook (be a Fan) and Twitter (follow along) to announce the location for the day, and just like Field of Dreams, people come. Why, you might ask. Because Kooper’s Burger Wagon serves up one of the finest burgers I’ve had in a long time. I had a chance to see them in action recently at the Pigtown Festival. Between the people buzzing around it like bees to honey and the aroma of flame cooked beef, that Wagon was hard to miss. All I had to do was step on up, give the folks my order, and about five minutes later I was handed a freshly cooked hunk o’ beef that puts a Big Mac or Whopper to shame. Good thing it was served on a thick, soft bun because it was so juicy that your run of the mill fast food chain bun would have turned to mush in seconds. Personally, I was too busy stuffing my face with this burger love, but Sweet Mary, who joined me in this burger adventure, captured it. We had a chance to chat with one of the owners while we waited. I wish I would have had more presence of mind to find out what cut of beef they use. I’m sure it’s probably some special, secret blend that they concocted because even when I use 85/15 or 80/20 mixed with a bit of sirloin, I can’t get that texture, moisture, or flavor. So Kooper’s, tell me, what the heck are you using? I really hope this venture is successful. Because after I had finished my burger, I felt like I had not only eaten but been nourished. Now, how can I convince them to pay a visit to Main Street Ellicott City? I’d say there’s a movement afoot to get back to good fast food, at least in the DC/Northern VA area–noteworthy are the Five Guys franchise (fresh burgers AND fries), Spike’s (you remember him from Top Chef) Good Eats on Capitol Hill in DC, Ray’s Hellburger in Arlington…, and The Burger Joint now in Alexandria…but when I get back to Baltimore (I’m a native) I’ll be sure to find my way to Koopers. Five Guys….yum. I adore their fries too. A think the world (or at least my world) would be a much better place if there were more old school butchers around. Sometimes, I really think I was born in the wrong era.